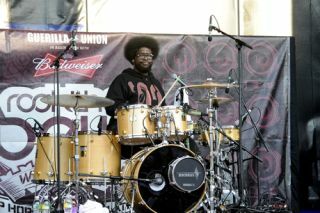 Uber cool drum maestro ?uestlove has joined forces with John Legend. The pair have recorded an album of '60s and '70s covers. Tracks by Marvin Gaye, Roberta Flack and Nina Simone are among those on the album. ?uestlove told Rolling Stone: "People tend to frown on the cover album. So, I wanted to choose cover songs that were so under the radar, so uniquely interpreted, that it would take you a second to realise that these are cover songs". This is one album we're definitely looking forward to hearing. In the meantime, check out this awesome ?uestlove solo. Nice.